This is great news, and very nice to see so soon after a big expansion. These beers look very unique, and really seem to push the boundaries. Can't wait to try them. 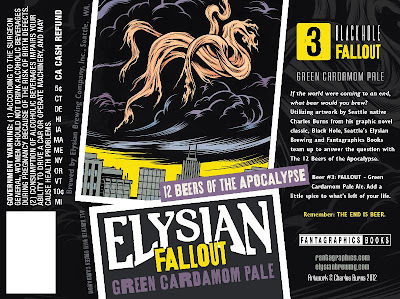 "In a year-long run-up to the end of all time (according to the Mayan calendar), Elysian Brewing Company and Fantagraphics Books, both of Seattle, are planning a series of twelve beers, issued on the 21st of each month in 2012 and featuring the label artwork of Charles Burns. Taken from Burns's weirdly apocalyptic work "Black Hole," the labels will adorn Elysian's "Twelve Beers of the Apocalypse," featuring the creativity and unusual ingredients for which its brewing team is known. What twelve beers would you brew (and drink) if you knew they would be your last?" "First up in January is NIBIRU, named for the mysterious planet X supposedly on a collision course toward Earth. 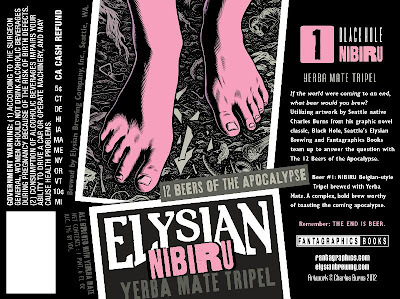 The Elysian / Fantagraphics Nibiru will be a Belgian-style Tripel flavored with an infusion of yerba maté. Combining the tasty esters of Belgian yeast and the compelling tea-like flavors of the South American herb mixture, the beer will weigh in at around 7.6% alcohol by volume. A mixture of German Northern Brewer, Czech Saaz and American Amarillo hops round out the uniqueness of this first beer of the Apocalypse. Oddly enough there's another apocalyptic-themed Nibiru out there: a super volcano currently burbling most dangerously beneath Yellowstone National Park. It too is scheduled to end life as we know it very very soon." 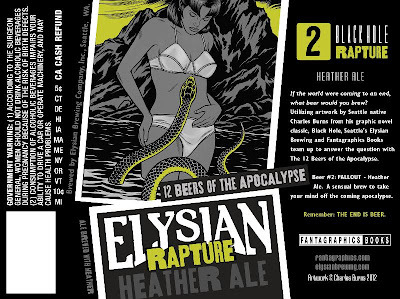 "February 21 will usher in RAPTURE, an ale of opulent proportions flavored with heather tips. Unlike the various Rapture events predicted by pseudoscientists and alarmist evangelicals, the beer will be very real and frankly delicious, combining the floral fragrance and slight bite of high country heather with Northwest Glacier hops in another 7% abv beer. FALLOUT follows in March, right around the time of the vernal equinox. 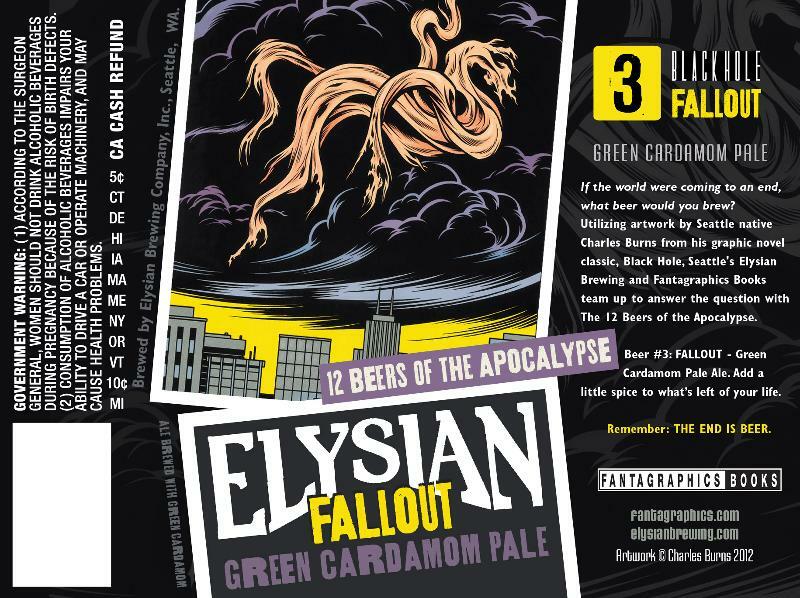 Fallout will be a pale ale made with green cardamom." 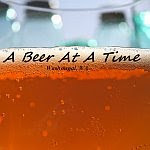 "As Earth's last year unfolds, other beers will appear as if by dangerous magic. Persimmons, chilies, raisins, blood oranges, rosemary and other herbs will be integrated into ales, lagers and Belgian styles using the finest local and imported ingredients. These limited brews will be available in bottles and draft and at select bars and bottle shops. 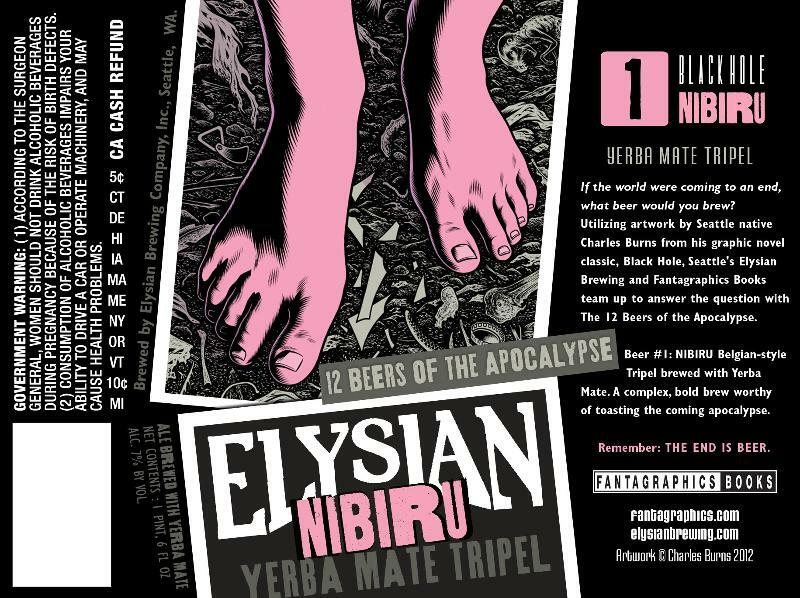 We will celebrate as they are released - on the 21st of every month in 2012 - with events at one or the other of Elysian's three Seattle pubs and at Fantagraphics headquarters in the Georgetown neighborhood. Once they're gone, these beers will never be brewed again. Then again, come December 21, that will be the least of our worries."